Do you want to keep track of the latest developments in drive technology? The latest news of our innovative, excellent products, solutions and services. Apply 0.1% deepest dimming characteristic to light mixing to achieve smoothest dimming and subtlest tunable white effect. Driver's dimming interface is compatible with main dimming interface(0-10V, DALI DT8, DMX, RDM) in the market. This series integrates with 24V auxiliary output、15 DALI power supply and energy reporting function. During providing the power to the wireless module, driver keeps two-way communication with wireless module. On the original basis, MOONS' publish two new high power drivers. 500W round shape driver, which is applied to the high power high bay lighting. 600W rectangle shape driver, which is applied to the high power stadium/ horticulture/flood lighting. 2.4GHz Wireless Solution, High Voltage NEMA Node Controller, Wireless Solution Demo. The DALI DT6 Tunable White Demo and High Voltage NEMA Node Controller will be launched in USA as well. • 0.9° Step angle stepper motor: NEMA14/17/23 HA series stepper motor high quality step angle precision and high torque output. • 3-phase stepper motor: NEMA 17/24/34 HC series products, also can provide 17 series of encapsulated, 24 series of Power Plus technology, 17 Zen series ultra-smooth motor. 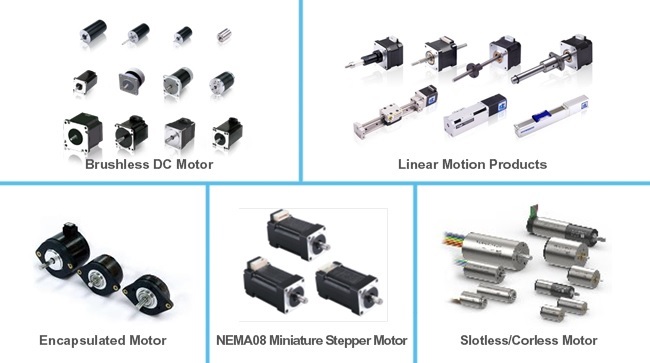 • NEMA8 miniature stepper motor: miniature stepper motor with 3.46° and 5° step angle be used in high speed situation. • DC brushless products: Circular series, diameter 16 to 57mm, power range 3~200W; Square 42BL~85BL, power range 30~300W. • DCU Ø13 Ø17 Ø24 series coreless brushed DC motor; ECU Ø13 Ø16 Ø22sreies slotless brushless DC motor. • Linear Motors: LE Series External Nut Type, LN Series Non-Captive Shaft Type, LC Series Captive Shaft Type. • Linear Modules: MS&CS Series Compact Linear Modules, SIMO Series Self-lubricating Linear Modules. • Linear Actuators: MLA&MCB Series Miniature Linear Actuators. And we have planetary gearboxes and permanent magnet stepper motors for exhibition as well.